Is it subversive for museum staff to unionize? As Marabou explores the idea of subversion in the museum, they’ve thought about the importance of perspective when defining a subversive act. Is it subversive for museum staff to unionize? If you are a museum employee who desires better and protected working conditions and wages, a union is one way of ensuring these things. So, is it subversive to advocate for your rights and the rights of your coworkers? Depending on who you are at the museum, the answer is yes. 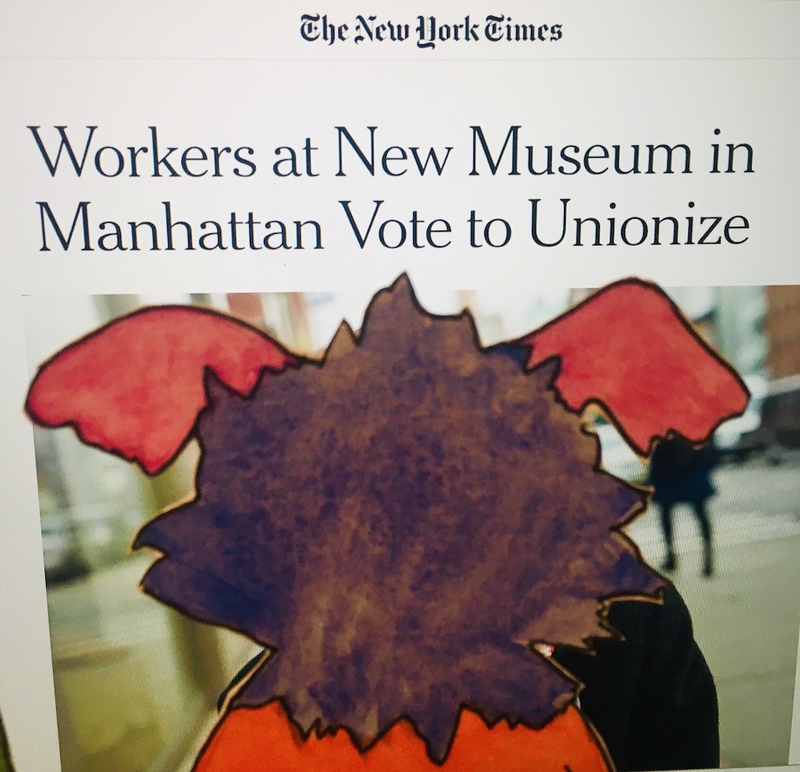 On January 24, workers at the New Museum voted in favor of unionizing with a final count of 38-8, as reported by the New York Times. The New Museum’s union move and how it was received illustrates that “subversion” is very relative in museum contexts. “I think that a lot of the timing had to do with the impending capital campaign. The museum is planning to take over the building next door, and break ground this year. The building will be designed by the architect Rem Koolhaas and his firm OMA. It’s an $85 million dollar expansion project. To us, it raises questions about the museum’s priorities. There are people working full-time at the New Museum making as little as $35,000 a year, which is not a living wage in New York. The capital campaign shows us that while the museum is capable of raising a huge amount of money in a short amount of time, they’re only willing to do it for the sake of expansion, not for the sake of their employees. Museum employees began airing grievances in conversations after work and went from there. With the institution in flux, there’s been a lot of stress and insecurity from the employees about the future, and how we can be guaranteed a say in our terms and conditions of employment. So, who thinks it’s subversive for New Museum employees to unionize? The Merriam-Webster dictionary defines “subvert” to mean “1. to overturn or overthrow from the foundation 2: to pervert or corrupt by an undermining of morals, allegiance, or faith.” If Marabou uses this definition, creating a union at the New Museum would not be overthrowing the institution from the foundation, but actually returning to the founder’s vision–not subversive at all. However the senior administration at the New Museum acted fast after the union move was made public. They hired Adams Nash Haskell & Sheridan (ANH&S) self-described “Union avoidance consultants with a 95% success rate” who assert on their website, “YOUR UNION-FREE FUTURE. THE POWER OF BETTER THINKING.” and tell potential clients, “Don’t wait to take back the control you’ve worked so hard to achieve.” With ANH&S’s input, the New Museum’s administration took measures intended to break down the union momentum. Art Forum reported that a number of staffers’ positions were reclassified to reduce the number of employees who would be eligible and protectable by the union. In addition, a meeting was held to express how a move to unionize would ruin the existing dynamic among museum staff likening it to breaking up a family. These union-busting tactics are not unique. The New Museum story is not unique. However Marabou thinks this story is worth highlighting because museum administrations must understand a move to unionize does not mean staff is ungrateful. Moves to unionize highlight that museums are complicit in perpetuating economic and power disparities in our society. Moves to unionize should be interpreted as demands to rethink how museums are structured. When staff decide to unionize, it should spark museum administration, and museums across the United States, to reconsider what aspects of museum operations get prioritized in fundraising. The New Museum is pretty confident it can raise $85 million for a new building in a few years. But what if donors were asked to give money to create an endowment that would guarantee certain wages and benefits to museum employees? If it’s a big challenge to raise enough money to ensure the safety and well-being of those who make the museum run, it says a lot about how little museum workers and their labor are valued. Is it subversive for museum employees to unionize? Depends on your position – as museum visitor, as museum Chief Financial Officer, as board member, as museum employee. It depends on whether or not you benefit from the status quo or benefit from changing the current structure. Is it subversive to want a living wage, health insurance, and job protection? Although unions are not the only way to achieve fair pay, benefits, and more, they are certainly a way, especially when an institution chooses not to work toward meeting its workers needs. Marabou stands in solidarity with New Museum employees.